Conserve water by slow it, spread it, sink it. Because we live in a summer dry climate prone to drought, it’s important that we continue to conserve water even when not in a drought situation. We have to make every drop count. This is especially true in the garden where 50-70% of all residential water use occurs. We all depend on the aquifers that exist below us. In normal rainfall years, approximately 50% of the water we use comes from groundwater stored in aquifers. During the recent drought, that number rose to 60%. Recently there have been a lot of reports in the news about the loss of aquifer in the Central Valley. Here is Sonoma County, although the problem is not as severe, we are draining our aquifer faster than it is being recharged. As reported in the Santa Rosa Press Democrat in June, 2015, three of the local aquifers, Santa Rosa Plain, Petaluma Valley and Sonoma Valley have been singled out as among the 127 across the state in danger of depletion. This means we are taking water out of these areas faster than it is being replaced. According to NASA researchers, it will take 11 trillion (11,000,000,000,000) gallons of water to replace the water lost statewide in our aquifers during the last drought. Recurring drought, climate change and increases in population will continue to challenge our ability to use our surface and groundwater effectively. Recharging the aquifer will become more and more important in the future. Did you know that, even though it is still hot in September, your garden needs only 60% of the water it needs in July? And in October, it needs only 30%? This is because plants use the amount of daylight hours to determine water needs rather than just temperature. But how often do we leave our irrigation set to water the same amount regardless of what month it is, until it begins to rain? So even if we are using an automated irrigation system, it’s important to monitor the controller so we are adjusting the amount of water each month based on the amount the garden needs. Consider upgrading to one of the new “smart” irrigation controllers or timers that adjust the run times based on the time of year and locale. They can be hooked up to a sensor that adjusts the run time based on local weather conditions. For example, if you system is connected to a sensor, it will automatically shut off the irrigation systems if it rains. These new controllers and timers can save thousands of gallons of unnecessary irrigation water. Drip irrigation is the most efficient watering system. Did you know that watering close to the crown of a plant rather than at the drip line is a waste of water? Plants take up water from their feeding roots which are located at and beyond the drip line (the edge of the canopy). Follow this link for general irrigation tips and follow this link for help in a great recommendation for properly determining how best to water trees. What other ways can you conserve water in your home landscape? Use permeable patio and path materials such as stepping stones, pavers, decomposed granite, gravel and path mulch rainwater is absorbed into the soil whereas non-permeable surfaces would allow that water to run off into the storm drains. The vast tracts of concrete and roadway have severely reduced the amount of permeable surface in the county. Every little bit of permeable surface we can add is important! Select plants appropriate to our summer-dry climate. Implement hydrozoning by grouping plants with similar water needs on irrigation valves. 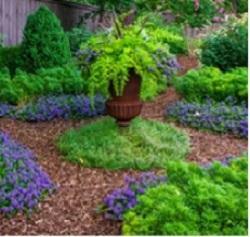 Mulch heavily to conserve water in the soil by reducing evaporation. And eliminate ornamental turf! It’s a high water use plant which offers no ecological value to the local fauna, requires chemical inputs which run off into our waterways and generates biomass from mowing.